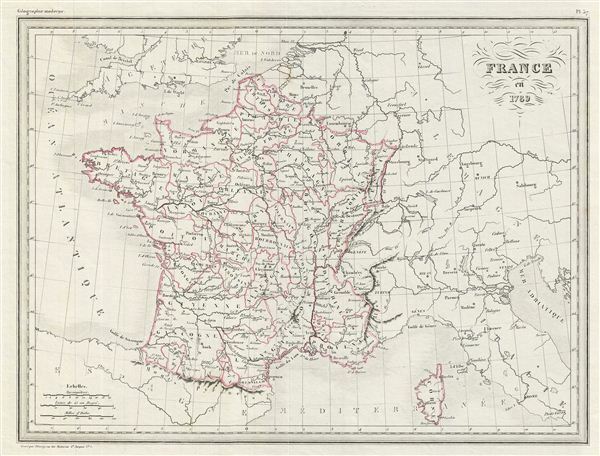 This is a fine example of Conrad Malte-Brun's 1843 map of France in 1789. Marking a period of historical significance, this map depicts the French empire before Napoleon's conquests. The color coding defines the designated borders of France in 1789. The French Revolution began in 1789 and resulted in the abolition of the French monarchy and its replacement with a radical democratic republic. In 1799, Napoleon Bonaparte staged a coup which led to Bonaparte's dictatorship and eventually (in 1804) his proclamation as emperor, which marked the end of the republican phase of the French Revolution. The 1812 French invasion of Russia marked a turning point in Napoleon's fortunes and led to the defeat of his forces at the ‘Battle of the Nations' in 1813. In 1814, a coalition of european powers defeated France and forced Napoleon into exile on the island of elba. Various cities, towns, rivers, islands and other topographical details are marked, with relief shown by hachure. This map was issued as plate no. 37 in Conrad Malte-Brun's 1843 Precis de la Geographie Universelle.